The 16th edition in a series of posts that highlight one Expert Author who has achieved success by doing just one thing exceptionally well. 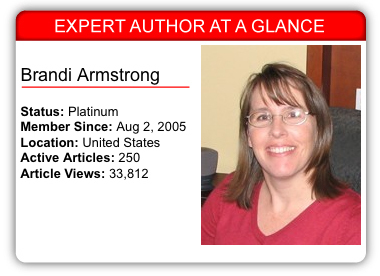 Brandi Armstrong is an experienced business owner. Her focus is on providing small and home-based businesses with telecommunications solutions designed to enhance their professional image and help them work more efficiently. As a small business owner herself, Brandi deals with the challenges of working in a hyper-competitive industry every day. She uses her writing to share the experiences of meeting and overcoming the common challenges she faces. Plus, she uses the experiences to create the best possible business solutions in her line of work. The key to Brandi’s success has been her ability to focus on consistency and quality in her writing. She understands that giving readers positive experiences with her content 100% of the time builds their trust, and that trust is the foundation of a solid business relationship. That positive first impression will make them feel a lot more comfortable with trusting you. Brandi has kept her writing consistent by striving to maintain her goal of submitting 3 new articles every week. She set a writing goal that’s realistic with her busy schedule. She feels that if she writes just to get to a certain number of articles, the content in each article suffers. So, instead her goal is manageable, but requires some focus. Imagine You Are Your Audience – If you’re able to put yourself in the position of the people you’d like to reach, it becomes much easier to write quality content for them. If you can think like them, that’s even better. Then you’ll have a perspective on the types of questions they would like answered and you can write articles on those points. Set Realistic Goals – Writing goals should reinforce the effort you put into your writing. They motivate you to stay on task and be consistent. However, if you expect too much out of yourself quantity-wise, the quality of each article may suffer. Enjoy Your Writing Responsibilities – It isn’t essential to have a heavy writing background to be successful in article writing and marketing. What is important is that you enjoy the writing process and the idea of helping others with your content. If you enjoy helping others, writing articles is a great way to have an impact on others while also generating traffic to your website. Share Something New – Give yourself a reputation for quality by sharing something new in everything you write. People are looking for new insights and ideas, so give that to them and keep your content fresh. This will ensure that they walk away knowing more than they did beforehand. Write Evergreen – High-quality articles will have an impact on the traffic you receive right away, but the best articles are evergreen and bring in continuous, never-ending traffic over time. Most articles you write should continue to work for you by attracting readers, even if the article was written and published several years ago. Use these tips today to write your next set of high-quality, original articles for more traffic back to your website or blog. Also, leave a comment to share how you keep up the consistency of your writing. Your consistent article production is inspirational. The concept of evergreen content is very good. I find in developing the best ideas, receptivity is necessary. While it is true we draw on experience, being open to ideas that present themselves seems to yield the best content. getting some quality articles done. be working for you years later. Your article is an anspiration to me. It simply show that there is light at the end of the tunnel for article marketing. Again, thanks for the sharing. I am impressed by Brandi’s goal of writing 3 articles every week. Given she’s a busy person and the nature of her business, writing articles so frequently is a major achievement. Article marketing must be one of her major investments in terms of her time. It definitely inspires me to put in more words every week in my own article marketing efforts. Thanks Brandi, I especially like number one. I am a skeptic and I can work that to my advantage. If I can imagine what I would like to read, then I know others will probably like it too. Thank EzineArticles, I especially like number one. I’m skeptical and I can work that to my advantage. Saagar, Your comment look amazingly similar to mine, just above? It impresses me favorably to the EzineArticles concern in monitoring the quality and the satisfaction of readers. Your messages and targeting instructional work with the writer are highly beneficial and commendable. Much, but thank you so much, EzineArticles. Very Helpful … How do you come up with 3 fresh ideas each week. Do your articles all pertain to you business or do they cover a wider range of ideas & experiences? I would like to earn money from my articles on hub pages. How do I do that. I got my profile in, but somehow I am lost on how to get my articles in for money. Thanks for your help in advance. This is inspirational. It’s nice to learn from an expert about elements of quality article. I’m still new in ezine article writing and don’t have anything worth publishing yet, I hope to see this expert sharing knowledge blog continue to run in the coming posts. At least I have bookmarked this blog. Thanks so much for sharing your insights. You put forth some great tips on consistency and building trust. Producing 3 articles a week of useful and evergreen content is an admirable target. The helpful perspectives you offer on putting your self in your audiences shoes and being careful to write with joy and purpose other than simply to get another article written are great mindset anchors. I love helping others reach their goals and potential and appreciate the helpful and honest tips you’ve shared with us all here. May you continue to lead. For everyone who possesses ideas, resources can be outsourced if need be. Most important is to get ideas for which you should keep your mind open. I think Brandi is doing the same. Maybe this article will help you with Hub pages. Am I allowed to nominate Brandi for Diamond Status? Or can that only be done through proper channels, and the special review process?